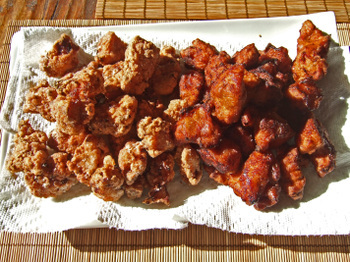 A Tale of Two Karaages - mmm-yoso!!! Are you a collector? Or maybe a pack rat? 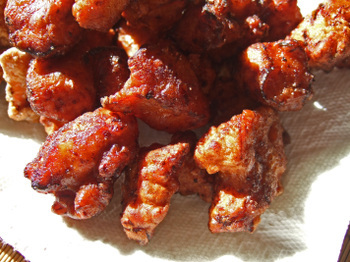 I was looking at my recipes folder the other day and realized that, gasp....I'm a Chicken Karaage recipe pack rat. 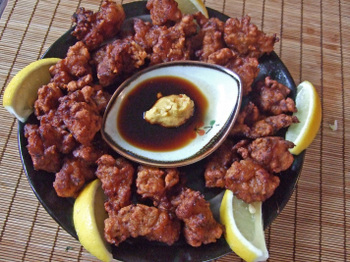 I've got at least a dozen different recipes for Chicken Karaage, Japanese Fried Chicken. I don't know how I got these recipes...god knows I'm not a "collector".......Though I come from a long line of pack rats, I consciously try not to be one. I can understand that living on an "island" with the possibility of shortages and strikes made having a back stock of necessities a requirement way back when....but sometimes it seemed like my Mom never threw anything away. I remember cleaning up after my Mom passed away back in the mid-nineties, and being amazed at the stuff she kept; jars of pennies, buttons("you never know you might need one "), a drawer full of pens - most not working(I never knew Tanoue's Saimin had pens), and even more touching, every single card; Birthday, Mother's Day, you name it, from the construction paper-crayon doodles of a first grader, to the silly one that played, or used to play, some silly tune. But among all those little things was about the equivalent of 2 cases of toilet paper stacked neatly, filling an entire closet(let's not get into spools of thread, or boxes of Kleenex). You know........just in case. I guess for previous generations, a modicum of hording was the norm. Looks like 2 recipes, doesn't it? It's actually the same recipe, but just to illustrate how changing one thing can change the entire dish. Combine ingredients and marinade chicken for 30 minutes. Remove chicken from marinade and drain. Version 1 - Put 1 cup potato starch and 1 tsp baking powder into a pan or large bowl, add the chicken cubes and coat well. Version 2 - Dust the chicken with potato starch, mix lightly. Combine marinade ingredients well; taste and adjust salt and pepper. Add chicken, mixing by hand and gently massaging sauce into chicken. Let sit about 10 minutes. Coat chicken in potato starch. Deep fry in oil heated to 350 degrees, until lightly brown. For an even more crunchy coat, use the double frying method, remove chicken when pieces float, let rest for 1 minute, and return to oil for about 30 seconds. I'm like that with recipes too. But once I finally get around to trying them all, I'll usually keep one and dump the others or I would come up with an adaptation. So if I absolutely had to pick just one of the recipes above, which one would you recommend? The familiar one you normally use or the "interesting" one? My missus is trying to cut back on fried food. I may only get one shot at chicken karaage and it needs to be a good one. Hi Alan - I'd go with the classic method...try it out the two ways. 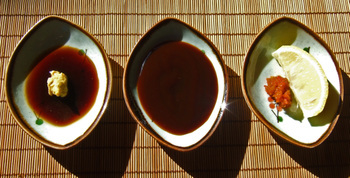 Make sure to taste you marinade before you mix the chicken in it - it will give you an idea of how things will taste. I totally can relate to the pack rat thingy as my husband and mother-in-law are masters at this! I usually keep things for awhile then when I get into a mode I throw them all out. The 1st version sounds more traditional. Would be cool for you to go through your whole stack and compare. my mother comes from that hoarding. i'm swear to god, if hilo town ever runs out of toilet paper, spam or cream of mushroom soup...she'll have enough. she MIGHT have to ration the shoyu but i'm sure there will be enough to go around. 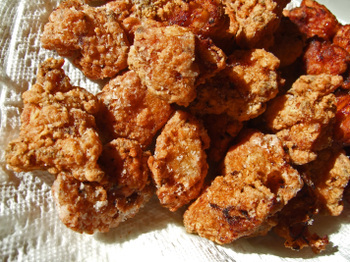 my mom once mistook confectioner's sugar for potato starch when making karaage. i have not been able to eat it and think of hers--it was seriously weird, but unforgettable. I've definitely inherited the pack rat gene from my mom's side. I've donated/recycled/thrown away a lot of stuff before I moved, but looking at all my unpacked boxes, I can't believe how much more stuff I should've left behind. "I'll need this plastic pirate sword again someday!" 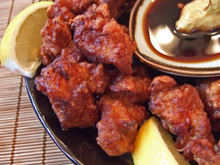 karaage is a bit similar to mochiko chicken (well besides the potato starch it'd be rice starch)...do you like that? Um, recipe collection is one of my shameful secrets. I supposedly have a system, but truth be told, my collecting teeters on the brink of out of control. Like you, Kirk, I come from a familial line of collectors and am still living amongst my grandparents "collection." Their obsession, er, um, collection, I should say tended towards practical items like your Mom's buttons, etc. Anyhow, I know I will be able to find your recipe for kara age when I need it, so I'm not gonna print it out to add to the folder! I love it when you cook Kirk! I always learn from you. Also, I am so happy that your new blogger, Omar visited my area! But how come you and the Missus did not come?!? Hi Reece - If there's a shortage I know ehere to go! Hi Farrah - I enjoy making Mochiko Chicken Wings....hmmm, better start thawing out those wings - thanks for reminding me. Hi Amy - I love your comment and observations...so true. Practicality as the basis for hoarding rings so true....'cause you never know when it'll be needed! Hi PE - Happy New Year! We'll get there....I promise.